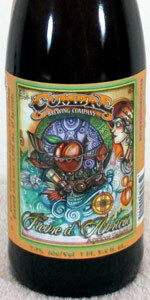 Home Beers La Cumbre Brewing Co.
Fievre D' Abricot | La Cumbre Brewing Co. Served in a Belgian tulip at La Cumbre's brewery on the day of the tapping, August 6, 2014. Orange colored and cloudy with a red hue. Almost glowing in appearance. The head is a finger and a half of pale white foam. Settles in a layer of lace over the body. Smells rather malty, orchard- like fruit and some tartness and sweet. It's grainy and almost granola-like. Hard to detect much else. Abundant with fruitiness, it truly tastes like apricot, including some of the tartness. A nice balance of of vanilla gives this a kind of peaches and cream deal. Still, there's the earthy saison quality and that flavor like fresh lilies. At the finish, the apricot lingers on my tongue. Tartness will hit you on this one, but this beer is creamy and thick-bodied. A lot of malt balances out the heaps of apricot. It's got a semi-dry finish and medium carbonation to boot. There's not a hint of booze. It's tasty. I could enjoy several of these. The nose was a bit of a letdown, but otherwise this beer shines. Fievre D' Abricot from La Cumbre Brewing Co.